May First Friday Riverfront Festival will take place in the conventional area by the river walkway entrance at Adams and First Street from 5 p.m. to 9 p.m. There will be food trucks, Corey Cox in concert, kids’ activities and carnival rides by K.D. Entertainment, retail and artisan vendors, the dunk tank featuring Auston from MIX 105, and the Cancer Services of Grant County Walk of Hope and Party!! It’s not too late to register for the Walk of Hope for $7.00. Walk of Hope group leader bundles are accessible in the Cancer Services of Grant County office. Group packages are for a group of 2 or more individuals and does not cost additional, unless you tally additional fun!! 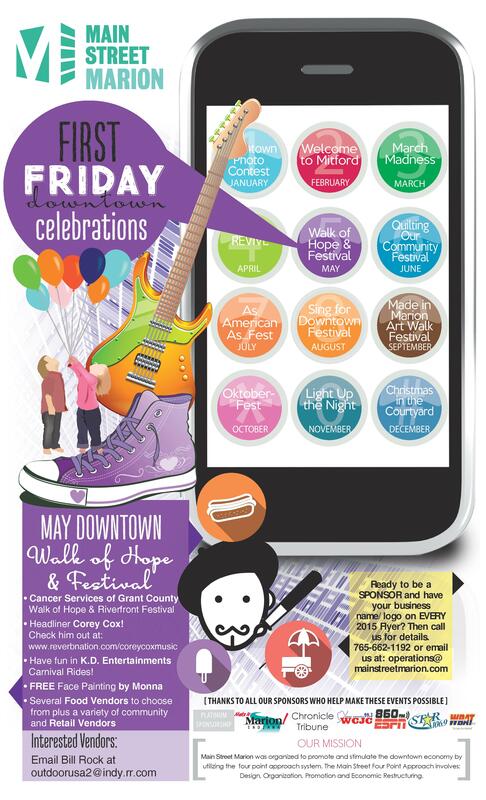 Cancer Services of Grant County will be registering walkers up until 6:30 p.m. the night of May First Friday. The walk will begin on Washington and Wabash Streets before the Riverside Community Federal Credit Union’s new building! People can line up on Washington and First Streets before the walk. Online enrollment for the Walk of Hope will end at 12 p.m. the day preceding the Walk on Thursday, April 30th. You can enroll online at this connection –https://csgcfundraisers.webconnex.com/Walk2015. First Friday is a month to month downtown celebration, and street festival in the summer months, that energizes cooperation between non-profits, students, and businesses in Marion, IN. This activity showcases downtown establishments every First Friday, every month. Come and see what downtown Marion brings to the table. We anticipate seeing you on the first Friday of each month downtown. Thank you for helping us make a positive difference in our community!